The update meant some users were unable to make or receive calls and caused issues with users’ Touch ID feature. 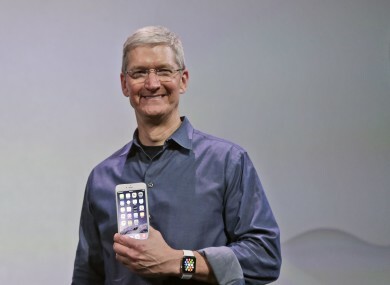 Apple CEO Tim Cook announcing the iPhone 6 and 6 Plus earlier this month. APPLE HAS COME out and apologised for releasing an iOS8 update which left some users unable to make or receive calls. The update, iOS 8.0.1, came exactly a week after the new operating system was officially released. It went live last night before being quickly taken down after users reported dropped phone signals and problems with Touch ID. Apple said it’s working on a new version, iOS 8.0.2, that would fix the issue and will be released in the next few days. We apologise for the great inconvenience experienced by users, and are working around the clock to prepare iOS 8.0.2 with a fix for the issue, and will release it as soon as it is ready in the next few days. As a workaround, the company published a support document which allows users to reinstall iOS8 through iTunes. The error comes after Apple experienced a number of setbacks since it first announced the iPhone 6 and 6 Plus. Users were annoyed when it released the new U2 album for free and saw the album automatically download onto their devices without their permission. Apple then had to provide instructions showing people how to remove it. Also, claims that the iPhone 6 bends after it’s placed in users’ pockets emerged this week, although it’s unclear whether this is a widespread problem or not. Email “Apple's week goes from bad to worse as it apologises for buggy iOS8 update”. Feedback on “Apple's week goes from bad to worse as it apologises for buggy iOS8 update”.